It depends, apparently, what you're used to. Last night's first-ever Nets game in Newark's Prudential Center (against the Boston Celtics, who won 91-88 in a last-minute comeback) drew a mostly low-key crowd that filled perhaps three-fifths of the arena. The last thing one expects from a preseason game is something that actually resembles a regular-season game -- in turnout, volume, and intensity -- but the Nets actually got all that Tuesday night. The attendance for the first of their two games at Prudential Center was an impressive 12,790, which is roughly triple what the team routinely drew in preseason games at Izod Center in recent years. There were lots of discount tickets, several sections had a majority of empty seats, and one stretch of the upper deck was cordoned off. (See video above.) But season-ticket holders were not obligated to come, as noted by Al Iannazzone of the Record, making the total more impressive. 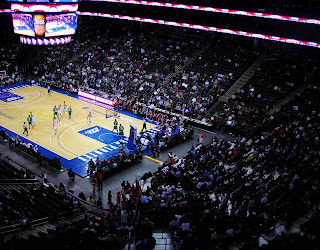 Still, the turnout wasn't the game-changer--15,000--that (as per D'Alessandro) might influence Nets brass to move at least temporarily to The Rock while waiting for the yet-unbuilt Brooklyn arena or, should the Brooklyn move fail, convince a new team owner that Newark can support pro hoops. The second came is October 21 against the Knicks; given the rivalry, turnout should be even higher, though not necessarily representative. I'm not sure 12,790 is triple the preseason draw; if previous attendance was 5500 fans at the Izod, then the new number is more like two and one-third times. And actual attendance, as opposed to ticket distribution, is routinely overstated. The crowd did get jazzed at the close finish, cheering and trying to distract Celtics players during late-game free throws. There were a lot more cheers for Newark-born star Queen Latifah than for Newark Mayor Booker, who wants to lure the Nets permanently if and when the Brooklyn move falls through. To be honest, for the first three quarters, it sounded like any other New Jersey-based Nets crowd I’ve grown accustomed to hearing. But there was definitely a little buzz in the fourth quarter as the Celtics took the lead and then the Nets battled to make it a back-and-forth affair in the closing minutes. Still, Brooklyn move supporters who have dissed Newark surely had to take another look at their predictions. The pseudonymous NetIncome, mainstay of the NetsDaily blog, in March had scoffed: "If there are more than 5,000 fans at that game, I'll be surprised." It was obvious why Newark is superior in many ways to the Izod Center, with the arena a long two-block walk from the city's Penn Station, but the Brooklyn arena, should it be built, would be even better for commuters using public transit. Those going to The Rock must cross a couple of very wide streets in pedestrian-unfriendly Newark, while a new subway connection from the Atlantic Avenue hub would offer direct access. There's lots of parking in Newark--right across and down the street from the arena. That's because elaborate promises of urban redevelopment have yet to come to fruition. While there's a little arena-related retail and entertainment nearby, the new facility hasn't been a major catalyst. By New York state's very loose definition, in which parking lots can be considered per se blighted, Newark is full of blight. In Brooklyn, the state would encourage blight by allowing the creation of a vast interim surface parking lot bookended by a historic district. Then again, the presence of the New Jersey Devils hockey team (along with Seton Hall hoops) has put Newark on the map in a way that sports--despite the incongruous connection of Newark and hockey--often does for smaller cities. Newark has rebounded far less than Brooklyn in the past decades. The Rock has much better video signage (see video above) than the Izod Center, whipping digital advertising around the arena clockwise like a video game. Presumably a newer arena would have even more bells and whistles, helping Nets CEO Brett Yormark appeal to even more sponsors. Seats at The Rock are much more comfortable than at the Izod Center--duh. The staffers at the concession stands seemed equally slow. Yes, they're still closing streets adjacent to the arena. In Newark, the building is set a block back from the two crossroads, Market Street and Broad Street, so the streets being closed are smaller ones. In Brooklyn, given the plan to build the arena up against Flatbush and Atlantic avenues, should streets close (despite local denials that that would happen), the traffic impact would be much greater.